People talk about World War 1 differently than other wars. Its events are spoken of in hushed, reverent tones, as the bitter, senseless conflict of the early 20th century caused the deaths of millions over four painful years and tore Europe apart in the process. Translating the existential tragedy of trench warfare into a mainstream, blockbuster video game seems like a recipe for disaster. But based on what I've played so far, Battlefield 1 has done a pretty good job of embracing the human struggle and devastation of the war, providing historical context while retaining its trademark sense of immense scale and action-packed combat. Over the course of two days at an EA-sponsored review event, I was able to play over a dozen hours of Battlefield 1's myriad multiplayer and campaign levels. While my final verdict won't be in until Monday, I can dig into the first couple chapters of the single-player War Stories and the all-new Operations mode, which will be available on October 13 in the Play First Trial available to EA Access subscribers. The prologue chapter Storm of Steel does a lot to set the overall tone for Battlefield 1. It opens with a series of title cards which describe the futility and devastation of "The War to End All Wars", and thrusts you into the boots of a random member of the Harlem Hellfighters, an African-American military unit currently battling on the front lines of the Western Front. You'll do your best to fend off German infantry amid bombed-out buildings and charred forests, but eventually you will be overwhelmed, and you will die. 'Julius Beaufort', the screen reads as your soldier falls to the ground in slow motion. '1888-1918'. The action shifts to another soldier, this one manning a turret while fending off wave after wave of approaching infantry. Artillery fire from an airship overhead destroys your turret, taking you out along with it. And so you find yourself in someone else's shoes, and you continue to fight - though for what, you're not entirely sure. It's a surprisingly somber start to a series that normally revels in the chaos of video game combat. The more I played, the more I found the tone holds consistent throughout, even in multiplayer. Yes, there are competitive arenas, and you'll likely fight someone on the internet whose handle has a reference to weed or genitalia at some point, but Battlefield 1 is striving to show a base level of respect, accuracy, and humanity with the source material, and the overall experience is much better for it. Take the first main single player chapter, titled 'Through Mud and Blood'. In it, you follow a young tank driver named Edwards as he finds himself assigned to a small crew of three other tank operators working on a behemoth known as 'Big Bess'. Together, they'll assault a German fortification, find themselves overrun by the enemy, and be forced to make a do-or-die push toward the rendezvous point if they want to survive. It's a relatively brief vignette, as its four stages can be finished in a little under two hours, but it's highly effective at providing a slice of a much larger conflict. Even though you only spend a brief time with your comrades, each one is given enough room for their individual quirks and charm to shine through. It also hammers home just how much the Great War was the beginning of this new, high-tech approach to combat, as hulking tanks could cause untold destruction in one moment and break down in the next. Heck, these soldiers don't even have proper communication lines, and have to rely on carrier pigeons to call for backup (which you'll even do during a particularly emotional segment of this chapter, as you guide the pigeon back to base to request an artillery strike, the utter inhumanity of the battlefield buzzing below you as you fly past). This chapter also serves as an effective tutorial for the Support class for multiplayer, instructing you how best to maneuver your tank, with front armor plating that can take heavier attacks than its weaker sides and rear, and how to use your wrench to repair it before it gets destroyed. The rest of Battlefield 1's War Stories aim to tell similar short tales from across multiple fields of conflict and from several different viewpoints, and if they're as effective and well-told as this one, I'll be very impressed indeed. Then there's the multiplayer, which is much more in line with Battlefield's standard operating procedure, as 64 players combat one another with a variety of period-specific automatic and bolt-action rifles, as well as artillery, airships, and more. The Operations, however, are the meat of the Battlefield 1's online multiplayer, and aim to give more historical context to your typical competitive meat grinder. Operations are essentially groupings of Conquest maps - Battlefield's signature multi-tiered capture-the-point competitive mode set on large maps with constantly fluctuating battle lines - only given larger import thanks to their historical framing. In the Play First Trial, you'll be able to play Operation Kaiserschlacht, which is set on the Western Front. 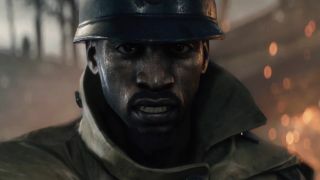 It's based on an actual offensive from World War 1, and before each mission, you're given some historical background on why these it was important to the war, as well as some monologues from front-line soldiers explaining their own thoughts and motivations as they enter combat. It's a relatively small touch, as the overall combat and structure will be familiar to anyone who's played Battlefield before, but it does so much to help sell its reverent approach to the war. Teams are split into attackers and defenders: attackers are trying to capture and hold several points in order to push the enemy back and capture their headquarters, while the defenders are attempting to prevent the attackers from doing so. The attackers have three attempts to take control of the map, and if they're successful, the battle doesn't stop there - all of the action carries over to another huge map, where the process continues. To top it all off, zeppelins or battleships are added to the mix with each subsequent attack, further changing how both sides approach each round of combat. These matches can easily last up to - if not over - an hour. While that may be a lot of time to devote to a single match, the weaving of history and interconnected maps increases the sense of scale and realism, even while many of Battlefield 1's weapons and vehicles have been adapted to be more immediately accessible and video game friendly. I'm planning on putting more time into Battlefield 1's multiplayer modes - as well as the rest of its single player content - once I get final review code later this week, but so far I'm pretty impressed with Battlefield 1's marriage of history and combat. Look for my final verdict on Monday, October 17 at 3am Pacific.